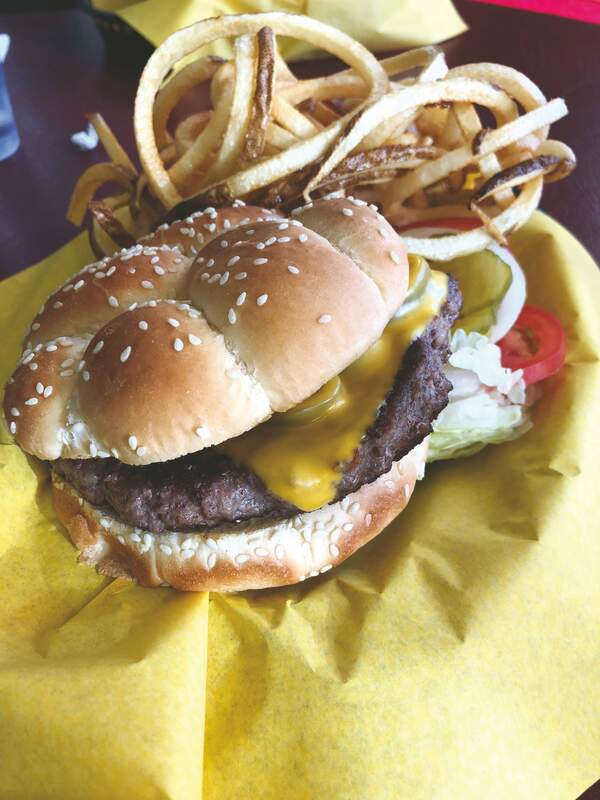 The jalapeño burger and curly fries at Aztec Family Restaurant. 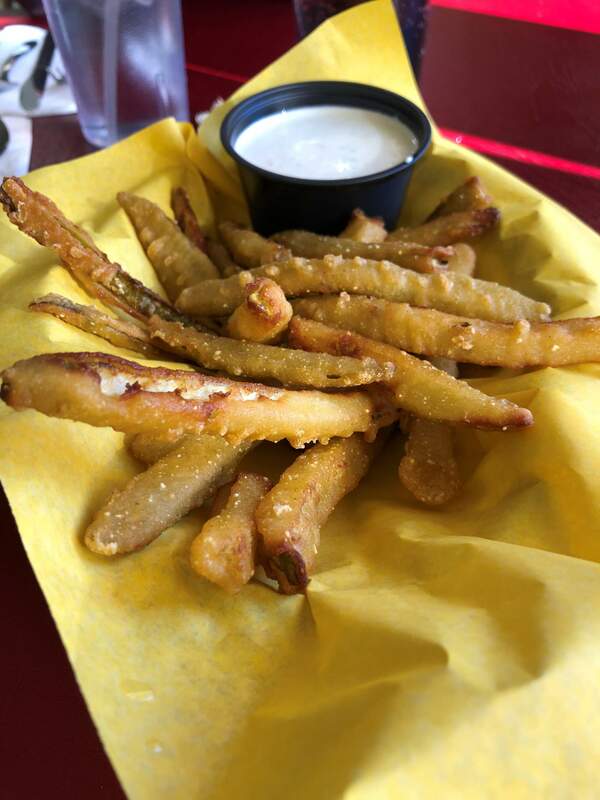 Fried pickles at Aztec Family Restaurant in Aztec, NM. 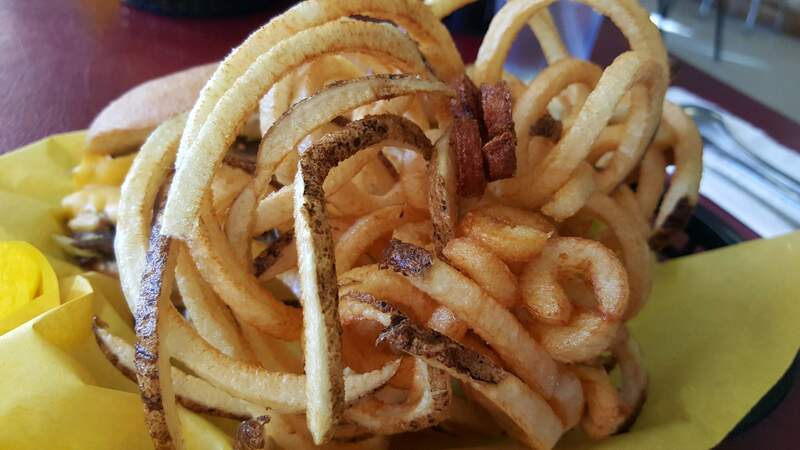 A tangle of curly fries at Aztec Restaurant. The Southwest Sub at Aztec Restaurant. Not that that’s a bad thing, mind you. It’s just a fact. This little family restaurant, right off Aztec Boulevard, is the epitome of what I’d call “down home.” It’s quaint, kinda kitschy in places, and it’s a place where you can grab a solid meal without having to worry about feeling out of place in dirty jeans or sweats. And that’s precisely what we did recently on a trip to Aztec. We decided to swing by this restaurant in the middle of the afternoon on a Thursday after fasting for much of the morning out of laziness. The first thing I noticed when we walked in was that there was really no formal process for being seated. “Sit wherever you like,” the woman behind the counter called out to us. There were plenty of tables to pick from – apparently most people eat lunch at, well, the normal lunch hour – so we grabbed one near a window and prepared ourselves for some good ol’ country cookin’. The menu at Aztec Family Restaurant is long and comprehensive. There are burgers, Mexican dishes, and plenty of fried appetizers, and there’s even a salad bar if you’re feeling green. I rarely feel like going the green route (or healthy! Yolo? ), so I settled on a basket of fried pickles and the jalapeño burger with curly fries. My dining partner, who was as famished as I was, opted for the Southwest Sub, a sandwich made of sliced roast beef, green chiles, and cheese on a hoagie roll. Our fried pickles arrived pretty quickly after ordering, a godsend when you’re as hungry as we were. They definitely don’t make you wait at this little place. And, you know, they were pretty decent fried pickles. The breading to pickle ratio could have been a little more on the pickle side, but they were hot, crunchy, and the seasoning in the batter was pretty darn good. The food arrived shortly after, and holy huge servings, Batman. There was a ton of food on each plate. My burger was massive and cooked to perfection, but I had to dig it out from underneath a proverbial mountain of curly fries. My friend had the same issue. Her sandwich was barely visible under the curled potatoes. If you’re going to eat at Aztec Family Restaurant, be sure to bring your appetite. Both were solid choices, but neither of us were able to make a dent in our main dishes – the copious amount of fried pickles had already helped temper our appetites, and I would venture to guess that we wouldn’t have been able to eat half the food we were served even if we hadn’t gorged on an appetizer. Not without causing permanent damage to our stomachs after they exploded from the weight of a thousand fries and burgers, anyway. We tried, though. We definitely tried our hardest to make a dent in those plates, in part because they were the epitome of comfort food, perfect for a cold, slushy day. My burger was cooked to the perfect temperature, and the jalapeños gave it just the right bite. The mound of curly fries, while insurmountable, were clearly made in-house, as they were strings of curly potatoes rather than breaded, seasoned fries like the ones at a fast food restaurant that shall not be named. And, my friend was equally enthused about her meal. 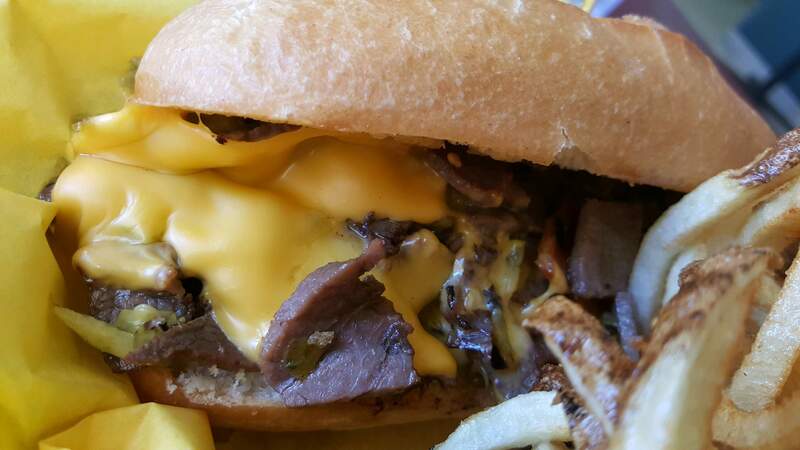 The green chiles gave her sandwich an interesting kick, taking what could have been a “just fine” roast beef sandwich to pretty darn good territory. Look – as I said, you won’t get any fancy accouterments or white linen cloths at Aztec Family Restaurant, and that’s all right with me. It’s a great place to pop in, have some solid comfort food, and then roll home, stuffed to the gills with fried potatoes and carb-loaded sandwiches. Having a place like that on your list is never a bad idea.